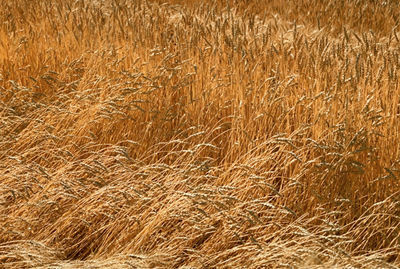 Metcalfe, David R.. "Barley". The Canadian Encyclopedia, 23 March 2015, Historica Canada. https://www.thecanadianencyclopedia.ca/en/article/barley. Accessed 23 April 2019. Barley, common name for members of genus Hordeum of the grass family (Gramineae). Many wild and cultivated forms occur and, since all cultivated forms and some of the wild ones are interfertile, they are assumed to belong to one species, H. vulgare. Because of its ability to adapt to a wide range of soil and climate conditions, barley is widely grown in many parts of the world and was one of the earliest cultivated crops. Although the centre of origin is not known, barley has been gathered or cultivated for thousands of years in the Middle East, Far East, North Africa and east-central Africa. 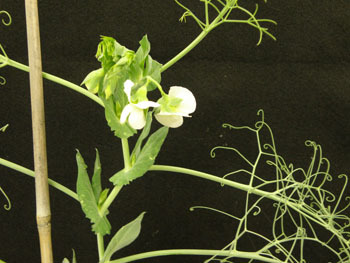 The barley plant has a cylindrical stem which is hollow, except at the nodes (solid areas from which the leaves arise). The spike or head is composed of spikelets attached to the nodes of a zigzag structure known as a rachis. Each spikelet consists of 2 husks or hulls, enclosing male and female floral parts. The rachis nodes may have either one or 3 spikelets, giving the spike the appearance of having 2 or 6 rows of kernels; hence, the names 2-rowed and 6-rowed barley. 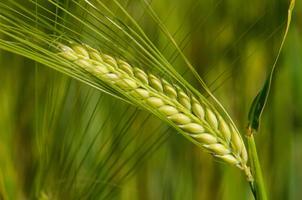 Barley is referred to as having either a spring or a winter habit of growth. Spring-sown types, which mature in 80-90 days, predominate in Canada. Slightly acid, well-drained loams or clay loams are preferred. Barley can be attacked by fungal plant diseases (eg, stem rust, smuts), bacterial blight and virus diseases (eg, yellow dwarf). It is also prone to agronomic problems (eg, weak straw, head shattering). In Canada, plant scientists working to improve barley are producing new strains (cultivars) with genetic resistance to disease, higher yield and improved agronomic features. Most of the 3.9 million ha devoted to barley production in Canada is located on the Prairies. Approximately 10 million t of barley was produced in 2006: about one-half is marketed through commercial channels; the remainder is kept on the farm for livestock feed or for seed. A large proportion of marketed barley is made into malt for beverages or malt-enriched food products (see Brewing industry). Barley can also be made into pearled grain for soups, into flour for flatbread or can be eaten as porridge. Canada exports approximately one-half of the barley it markets (currently 4.8 million t annually), representing about one-fifth of world exports. See also Grain handling and marketing.